Antique/Vintage - Hall China Company Tea Pot with Lid,in the #052S Pattern of Chartreuse and 22kt Gold, Circa 1920's. Hall China Company Tea Pots were considered the Best Tea Pots Made in the 1920's thru the 1940's. 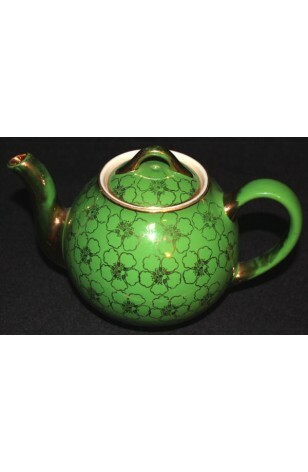 This is a beautiful Chartreuse and 22kt Gold Tea Pot and Lid, in the French Flower Pattern. The Tea Pot is in a French Shape, Has 22k Gold all over Flowers, 22kt Gold on Handle, Spout and Lid. A Very Striking Tea Pot in great condition, which would be lovely to use, or to display with pride. Hall China Company Tea Pots were considered the Best Tea Pots Made in the 1920's thru the 1940's. This is a beautiful Chartreuse and 22kt Gold Tea Pot and Lid, in the French Flower Pattern. The Tea Pot is in a French Shape, Has 22k Gold all over Flowers, 22kt Gold on Handle, Spout and Lid. A Very Striking Tea Pot in Very Good Resale Condition unless noted below or in pictures. Would be lovely to use, or to display with pride.